Here's a great fundraising idea that my Relay for Life team developed. We purchased 60 small teacups and saucers off ebay. We took the cups to a local candle making shop and had them put a wick and scented candle wax in the cups. They gave us a discount since we were raising money for American Cancer Society. 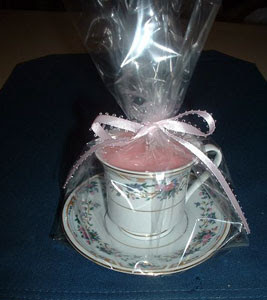 We then glued the tea cups to the saucers, put them in cellophane bags and tied on a pink ribbon. We sold them for $10 each, with the proceeds ($400) going to American Cancer Society. Editor's Note: As I told Angela when I notified her that she had won our craft contest for January, this selection is especially meaningful to me this month. 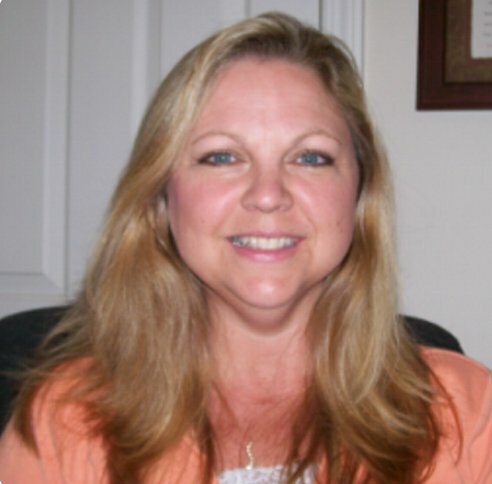 My mother was diagnosed with colon cancer last year on Jan. 2 and passed away 31 days later, on Feb. 2, 2007. I think mom would have loved these candle teacups too, she collected miniature teacups when she was young and passed them on to my oldest daughter a few years ago. As soon as I saw this submission I knew it was our winner for January! If you'd like to visit the American Cancer Society for more information their web site is www.cancer.org. Copyright © 2008 by Angela Bond. All rights reserved.